The Greater Los Angeles African American Chamber of Commerce (GLAAACC) will mark 25 years of honoring individuals, small businesses and corporations who have contributed to the economic growth and development of the African American small business community. GLAAACC’s 25th Annual Economic Awards Dinner will be held on March 30th at the JW Marriott LA Live, 900 West Olympic Boulevard in downtown Los Angeles, beginning at 6:00 p.m.
Sam Iacobellis, former chief operation officer for Rockwell International and the person responsible for development of the B-1 bomber, chaired the first Economic Awards Dinner in 1994. Daniel S. Goldin, NASA’s longest tenured administrator was the first keynote speaker. Over the past two and a half decades, the Economic Awards Dinner has had many illustrious guests and keynote speakers from a variety of industries such as presidential appointees, elected officials, executives from private and public sectors and sports. Notable keynote speakers have included Yvonne Brathwaite Burke, Los Angeles County Supervisor (1998); California Governor Gray Davis (2001); Los Angeles Mayor Antonio Villaraigosa (2008), Earvin “Magic” Johnson, chairman & CEO of Magic Johnson Enterprises (2009); U.S. Small Business Administrator Maria Contreras-Sweet (2011); U.S. Secretary of Labor Hilda Solis (2012); U.S. Assistant Secretary of Commerce Manufacturing and Services Nicole Y. Lamb-Hale (2013), and Steve Ballmer, owner of the LA Clippers (2017). Mistress and masters of ceremonies have greatly contributed to making GLAAACC’s Economic Awards Dinner a premiere event. 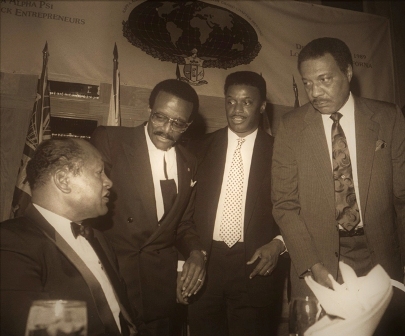 The late Johnnie Cochran, the legendary defense attorney for Michael Jackson and O.J. Simpson, was the first master of ceremonies. More recently, actresses Dawn Lewis (“A Different World,” “Hangin’ with Mr. Cooper”), Vivica A. Fox (“Independence Day,” “Soul Food,” “Set it off”), Terri J. Vaughn (“Steve Harvey Show,” “All of Us”), actor and comedian Flex Alexander (“Uptown Comedy Club,” “Girlfriends”), KABC7 Anchor Mark Brown and Los Angeles City Council President Herb Wesson are a few of the professionals that have kept the audience entertained and the evening running smoothly. This year, recognition will be given in categories such as African American Business of the Year, Banking and Financial Institution of the Year, Public Service, Purchasing Executive, Construction Company of the Year, Small Business Advocate, Public Works Contractor of the Year and Corporation of the Year. For more information on GLAAACC’s 25th Annual Economic Awards Dinner, visit GLAAACC.org or call (323) 292-1297.